Teeth whitening is often expensive – you can expect many professional treatments to cost in excess of $500. Crest 3D White Supreme FlexFit Whitestrips, however, have been proven to be as effective as professional laser treatments at a substantially lower price (view on Amazon). Teeth whitening has been shown to have many benefits. As well as being a cosmetic procedure, having whiter teeth can you boost confidence. They can also make you appear healthier and younger, which has a knock-on effect on your mental wellbeing. Because of its numerous advantages, teeth whitening has become increasingly popular over the years. Despite this, some people continue to have reservations about teeth whitening. This is often because the idea of it seems intimidating, or because they are unsure of where to begin. Researching treatments is important in aiding the balance between quality, price and safety. Everything that you need to know about Crest 3D White Supreme FlexFit Whitestrips and if they’re the right fit for you has been summarised by us in this review. Crest 3D White Supreme FlexFit Whitestrips boast patented FlexFit technology. Thanks to this, the strips are stretchier and mold much easier to your teeth than other whitestrips on the market. This, combined with several other innovative features contributes to the high efficacy of these whitestrips: Crest 3D White Supreme FlexFit Whitestrips have been shown to be as effective as a $500 professional treatment. 1.) Do Crest 3D White Supreme FlexFit Whitestrips work? Crest 3D Whitestrips are coated with a gel which contains peroxide. This is the ingredient which whitens the outer layers of the teeth and helps to remove any stains that may be present. The strip, which you apply to your teeth, holds the gel in place. Crest 3D’s Supreme FlexFit Whitestrips get their name from their unique FlexFit technology. But what does this mean? The innovative feature ensures that the whitestrips stretches and mold to custom fit your smile, whatever the size or shape. This is particularly effective as it holds the peroxide gel in place for the full length of your daily treatment. Because of this, Crest 3D White Supreme FlexFit Whitestrips are as effective at whitening your teeth as your average $500 professional laser treatment (view details). 2.) Are Crest 3D White Supreme FlexFit Whitestrips safe? These FlexFit Whitestrips aren’t just good cosmetically, they also use enamel-safe whitening agents to bleach your teeth. This means that the active ingredients used is kind to the outer layer of your teeth, which the whitestrips attach on to. Since your tooth enamel cannot be rebuilt, it’s a good idea to avoid whitening treatments which, unlike Crest 3D FlexFit Whitestrips, may be abrasive or contain potentially damaging ingredients. Each treatment takes 1 hour to complete. After 21 consecutive days of use, you can expect to see the full effects of the White Supreme FlexFit Whitestrips. However, it is important that you remember that you can only expect good results if you’re using the strips correctly. Furthermore, teeth whitening isn’t just about what you do when the Whitestrips are on your teeth – it’s about what you do when in the 23 other hours each day. During a period of whitening treatment (e.g. 21 days), your teeth are more susceptible to staining. This means that if you indulge in high quantities of dark, staining foods over this period, such as red wine or coffee, you’re likely to see slower results. Peel. In order to keep the peroxide gel in the correct place, the FlexFit Whitestrips come with a protective layer. If you attempt to use the strips without removing this layer, you won’t have a huge amount of success. Apply. You can then attach the strips to your teeth. Thanks to the unique FlexFit technology, this should not be fiddly. Press the strips into the contours of your smile to make sure that it stretches and molds correctly. Correct application is important in order to optimise effectiveness. Relax. The FlexFit Whitestrips take 1 hour per strip. You can continue to talk or even drink water with the strips in place as they are made with an advanced seal technology. Remove. After an hour, peel the whitestrips off your teeth. After 21 consecutive days of correct treatment, you should see the full effects of the teeth whitening. You can use whitestrips at any time of the day. You should avoid brushing your teeth immediately before using the whitestrips as this may cause gum irritation. Brushing your teeth after a whitening treatment should not cause you any harm. If used correctly, you can expect the results from the Crest 3D White Supreme FlexFit Whitestrips to last you for at least 18 months. However, there are things you can do in order to optimise results. Regular appointments with the dentist, using a whitening toothpaste between treatments and avoiding staining foods will all contribute towards longer lasting effects. The more effort you put in to maintaining your whiter teeth, the more results you will see when it comes to using your whitestrips. While Crest 3D White Supreme FlexFit Whitestrips are a really excellent choice for most people, it is important to consider that there could be other products out there that are better suited to you. If you want results that last significantly longer, opt for the Crest 3D White Whitestrips With Light which offer results that last 36+ months. For sensitive teeth, opt for Crest 3D White Gentle Routine Whitestrips and Sendsodyne True White Toothpaste. For severely crooked teeth, you could try the Opalescence Go whitening kits which allow the whitening gel to seep around the teeth. So are Crest 3D White Supreme FlexFit Whitestrips a good choice? Crest 3D White Supreme FlexFit Whitestrips may be some of the pricier whitestrips on the market, but they do deliver. Compared to a $500 professional treatment, the price tag seems relatively small yet the product boasts similar effects. Furthermore, these whitestrips feature unique FlexFit technology which is perfect for each individual smile, delivering an even treatment across all of the teeth. How do I know if my teeth are suitable for the Crest 3D White Supreme FlexFit Whitestrips? Most healthy teeth are suitable for using Crest 3D White Whitestrips. Best results are typically seen with yellow and brown teeth that do not have any dental work such as fillings and crowns. Gray teeth tend to be difficult to bleach and may require professional attention. What can I do if the whitestrips don’t stay put? Due to the FlexFit and Advanced Seal technology, slipping should not be a problem. However, if you do find this to be the case, simply dry your teeth with a tissue before applying. How often should I use these whitestrips? Crest 3D White Supreme FlexFit Whitestrips give results that last for 18+months so you shouldn’t need to use the whitestrips more than this. However, if you do desire further whitening, Crest recommend that you leave 6 months in between treatments for the safest and most effective results. 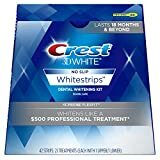 Do Crest 3D White Whitstrips expire? Yes, Crest 3D White Whitestrips do expire. They are still safe to use past the expiration date but the whitening agent may be less effective. No, whitestrips are only effective on natural teeth and will not alter the color of any dental work. If you have a lot of dental work, consult your dentist who can advise you on the best course of action. Does this cover all of your teeth? Crest 3D Whitestrips only cover visible teeth. This means that the whitestrips won’t cover your back teeth and only whiten the fronts of the teeth. Do these work on crooked teeth? While the most effective results can be seen on straight teeth, Crest 3D White Whitestrips can give great results on crooked teeth too. Take extra care to make sure that the whitestrips comes in contact with all areas of the tooth. You can use a toothpick to help you with this.